Cheese is something Banjo and I both enjoy. 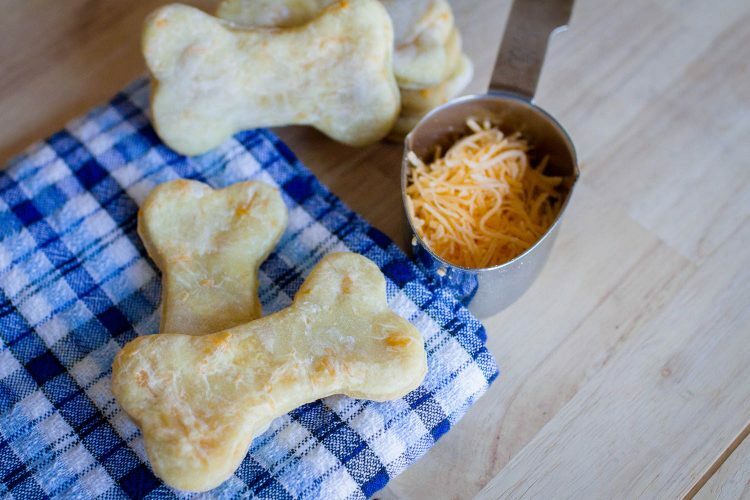 So when I stumbled across this cheesy dog treat recipe, I knew I had to give it a try. She loves it! Dogs are as guilty as humans of craving midday snacks and post-meal desserts. Just ask Banjo, my Boxer, who’s been inadvertently trained to come running anytime she hears the whipped cream canister being taken out of the fridge. 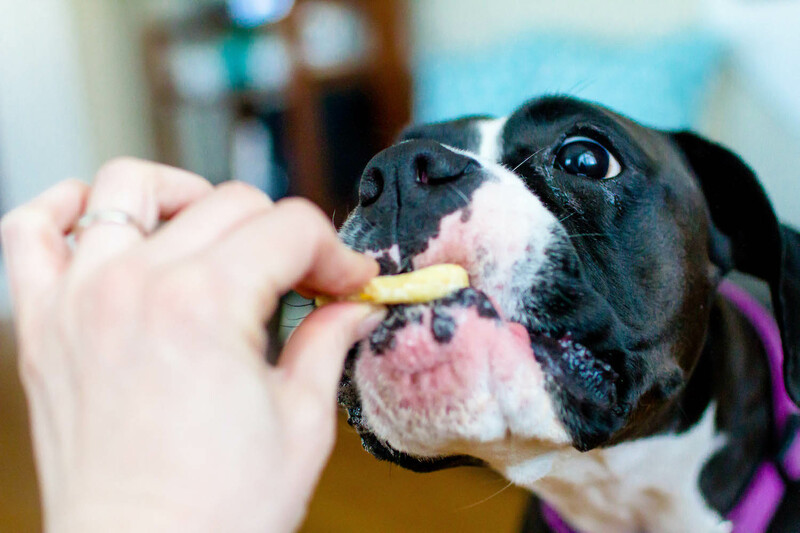 Although we should never indulge our pets with some human delicacies (like chocolate), there are other ingredients that are perfectly safe (in moderation) for your dog to enjoy. Cheese, for example, is something Banjo and I both enjoy now and again. 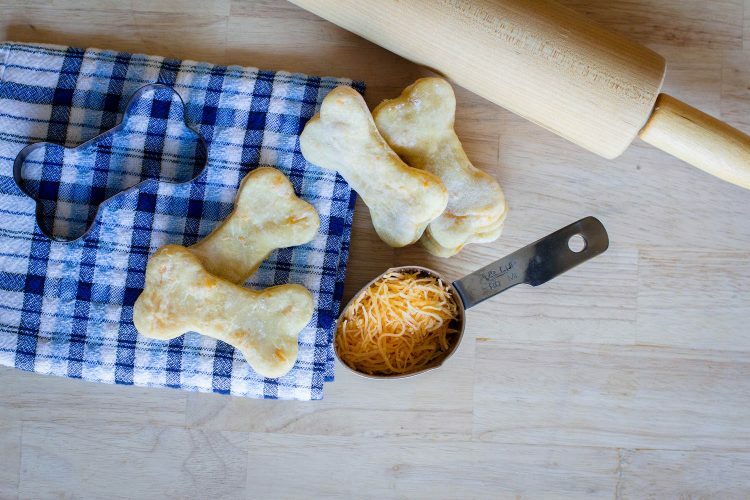 So when I stumbled across this simple dog biscuit recipe that included shredded cheddar, I knew I had to give it a try. Banjo, just sit tight while Mommy takes this photo. Dissolve bouillon in hot water. Add water mixture and egg to flour and combine. Knead dough until it forms a ball (approximately 3 minutes). Roll dough on lightly floured surface until ¼-inch thick. Cut into slices or use cookie cutters to make shaped treats. Place dough pieces on nonstick cookie sheet. Cook for 15 minutes for soft treats and 20 minutes for crunchier biscuits. Makes about 1 dozen large dog treats. The verdict is in, and Banjo loves these cheddar dog biscuits. The great thing about this recipe is that it’s quick, easy and uses ingredients you probably already have lying around the house. 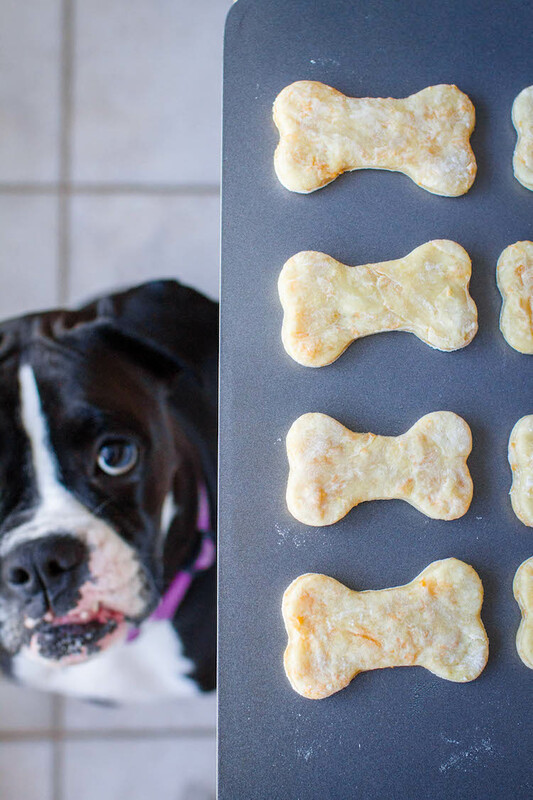 Plus, if you have more than one dog or your pup falls head-over-paws in love with these snacks, you can easily double the recipe and stock up. Banjo, who can be frustratingly picky with what treats she’ll eat, took a moment to slide her first cheesy biscuit across the floor, sniffing it endlessly before deciding that it passed her olfactory inspection. Since that first bite, she hasn’t hesitated to gobble down more and enjoys these biscuits cooked to soft perfection. Use a cookie cutter to create a fun shape for the treats. Adapted from Cesar’s Way Basic Dog Biscuits.